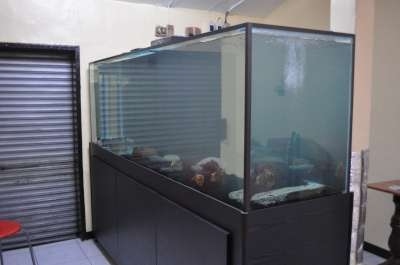 It was December of 2010 when i stated making plans for my 300 gallon tank with 75 gal SUMP. 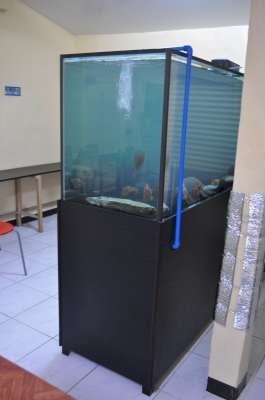 Initial plans for the tank are shown below, front display 8 feet long, 2feet wide, and 2.5 feet tall with a water volume of 300 gallons. The picture below shows the initial SUMP design for the filtration system, the final designed involving 5 compartment. 1st: Mechanical Filtration where the overflow pipe returns the water to the sump, this contains nets and filter wools. 2nd: 1st stage BIO filtration with lots of foams for the bacterial colony. 3rd: 2nd stage BIO filtration with lots of crush sand for the bacterial colony. 4th: 3rd stage BIO filtration with lots of ceramic rings for the bacterial colony. 5th: Houses the RIO 20HyperFlow pump that pumps the water up back to the aquarium. Below was the final design and layout as it was to be place in the house, construction stated on Feb 20, 2011 and delivered on March 2, 2011. 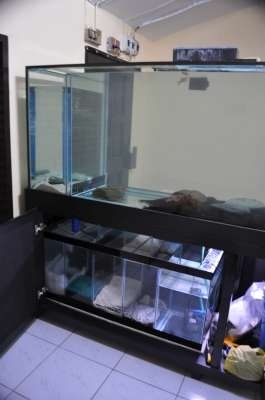 Tank testing, after about 2 weeks of wait it was time to leak test the tank and fill it with 300 gallons of water. Full picture of the tank, water was still hazy. Back side picture showing the return pipe from the sump that takes the water back to the aquarium using RIO 20HF pump. Above picture shows the partially completed sump filters, with 1st part contains mechanical filtration filters, with 3 succeeding compartments for BIO filters and finally the pump compartment. 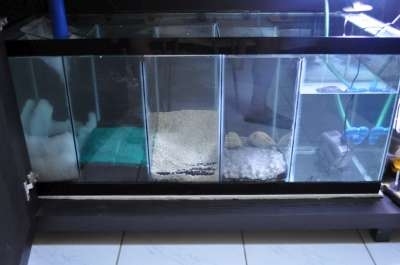 The picture to the right show the full view of the sump as it is contained in the cabinet under the aquarium. The next post will be filling the tank with Monsters =). * Images were drawn using google sketch.